Improving education and bringing the people a new voice in government. The next meeting should be an informative one. It will open with a discussion on the PA Primaries. Then, we plan to discuss the question, “Are you taxed enough already?” Citizens for Constitutional Government (CCG) will show a DVD: Repeal 16: Repeal the Income Tax–Repeal the Abuse. A discussion will follow. The topic of our March meeting (rescheduled due to snow last month) is Protecting Our Rights. We’ll be viewing a DVD titled “How To Restore America’s Constitution and Her Sovereignty”. The DVD, published in 2015, was from a 1996 presentation given by John T. McManus; President of the John Birch Society. The theme of the DVD is not “dated” in it’s perspective or relevance to our current fight to restore Constitutional principles. The last half of the meeting will be discussion and plans for action. We look forward to seeing you and don’t forget to bring a friend! The topic of our February meeting is Protecting Our Rights. We’ll be viewing a DVD titled “How To Restore America’s Constitution and Her Sovereignty”. A little long, but hits the proverbial nail! Just a little common sense, and a pragmatic eye. A great read and entertaining. average Americans to the political and media establishment. Rodham and Jeb Bush, and only a few cents worth between Rodham and the other GOP candidates. tossing Molotov cocktails at Wall Street and Georgetown while they watch the nation collapse. Besides, lightning might strike, Trump might get elected, and he might actually fix a few things. Pelosi and Harry Reid. Yet those same voters are supposed to trust the GOP in 2016? Why? Trump did not come from out of nowhere. His candidacy was created by the last six years of Republican failures. . . .and that’s just the short list. establishment candidates are better than barely listening to them, and Trump is their way of saying, “Screw you, Hillary Rodham Rove Bush!” The more the talking head political pundits insult the Trump supporters, the more supporters he gains. The only pundits who seem to understand what is going on are Democrats Doug Schoen and Pat Caddell and Republican John LeBoutillier. All the others argue that the voters will eventually “come to their senses” and support an establishment candidate. experts–and neither Rodham nor Bush are mechanics with the skills or experience to install it. abandoned. Jeb Bush is not a mechanic; he merely inherited a garage. Granted, Trump is also not a mechanic, but he knows where to find the best ones to work in his garage. He won’t hire his brother-in-law or someone to whom he owes a favor; he will hire someone who lives and breathes cars. “How dare they revolt!” the “elites” are bellowing. Well, the citizens are daring to revolt, and the RINOs had better get used to it. “But Trump will hand the election to Clinton!” That is what the Karl Rove-types want people to believe, just as the leftist media eagerly shoved “Maverick” McCain down GOP throats in 2008–knowing he would lose to Obama. But even if Trump loses and Rodham wins, she would not be dramatically different than Bush or most of his fellow candidates. They would be nothing more than caretakers, not working to restore America’s greatness but merely presiding over the collapse of a massively in-debt nation. A nation can perhaps survive open borders; a nation can perhaps survive a generous welfare system. But no nation can survive both–and there is little evidence that the establishment candidates of either party understand that. The United States cannot forever continue on the path it is on. At some point it will be destroyed by its debt. decades (even if we get inordinately lucky and none of them are ISIS infiltrators or Syed Farook wannabes); the world is at war with radical Islamists; all the world’s glaciers are not melting; and Rosie O’Donnell is a fat pig. tens of thousands. One electromagnetic pulse attack from a single Iranian nuclear device could kill tens of millions. Faced with those possibilities, most Americans probably don’t care that Trump relied on eminent domain to grab up a final quarter acre of property for a hotel, or that he boils the blood of the Muslim Brotherhood thugs running the Council on American-Islamic Relations. The establishment is frightened to death that Trump will win, but not because they believe he will harm the nation. They are afraid he will upset their taxpayer-subsidized apple carts. While Obama threatens to veto legislation that spends too little, they worry that Trump will veto legislation that spends too much. You can be certain that if an establishment candidate wins in November 2016, his or her cabinet positions will be filled with the same people we’ve seen before. The washed-up has-beens of the Clinton and Bush administrations will be back in charge. The hacks from Goldman Sachs will continue to call the shots. Whether it is Bush’s Karl Rove or Clinton’s John Podesta who makes the decisions in the White House will matter little. If the establishment wins, America loses.!! continues stressing the importance of voter ID in PA.
A copy of the Voter ID bill will be available. at the Quakertown Free Library, 401 W. Mill St., Quakertown. Bernadette Repisky will be our speaker. Bernadette is active in the Warminster Community and is a Committee-woman there. Her area of expertise is Islam. Her talk title is “Creeping Sharia”. An important discussion will follow. Please join us for an informative update on the pension reform issue here in Pennsylvania. Where do we stand in light of looming $50 billion + unfunded public sector pension liabilities? Raeann Hofkin , a Certified Payroll Specialist will be our speaker. She is a results driven payroll professional with 35 years ofexperience in all facets of payroll management and compliance. Raeann is currently the Director of Payroll for Trident USA Health Services and on the School Board of the Upper Perkiomen School District. Her perspective on Pa’s pension reform efforts and obligations will, undoubtedly, be insightful ! We will also have an update on Voter ID. Don’t miss this event and remember to bring a friend! A $5 donation would be appreciated to cover the cost of the room. From Hope and Expectation to Disappointment and Betrayal! 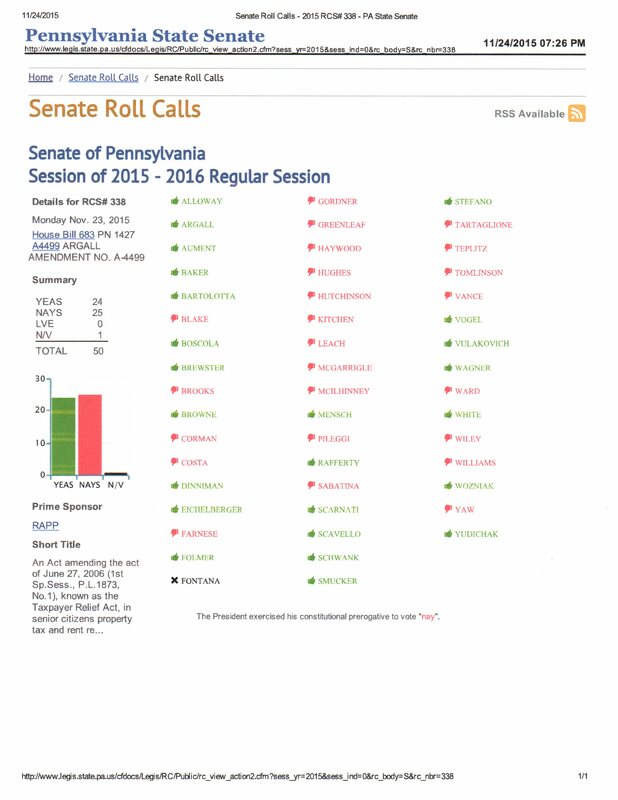 Late last night a Historic Vote took place in the PA Senate. The Senate voted on Elimination of School Property Taxes. This has never happened before. It shows how far we have come. We were rather confident. We thought we knew who was going to vote and how, based on what they have been saying. As the vote went on, we became concerned. After all 48 Senators voted, the vote was tied — 24 to 24. Lt Governor Mike Stack, acting as President, then cast the deciding vote. A yes vote and School Property Tax Elimination would pass. A no vote, you keep paying School Property Taxes. They increase greater than inflation. Foreclosures would continue and Seniors and those on low income would have less to live on. Lt Governor Mike Stack, voted NO!! He laughed like a giddy school girl. He apparently thinks that people losing their homes is a laughing matter. Earlier in the day, Governor Wolf came out against the plan, calling it a “distraction”. Final vote — 24 YES 25 NO School Property Tax Elimination was defeated. Think about Lt Governor Mike Stack and Governor Wolf and others when you pay your School Property Taxes the next three years. There were several betrayals. I will only mention one at this time. Senator Majority Leader Jake Corman led us to believe he supported this legislation. He caved to special interests that have the money and voted NO!! Possibly more to follow on him and others that betrayed you, me, and all Pennsylvanians. Do not give up hope. You got us this far. The fight is not over, it just got harder. We need to change the playing field. The fight to eliminate this unfair and antiquated School Property Tax system has been going on for a long time and we plan to continue it. We will keep you up to date. 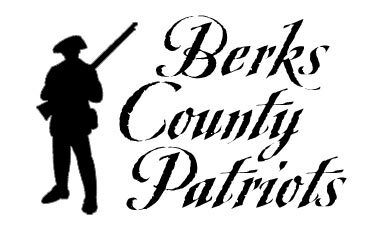 Copyright © 2015 Berks County Patriots, All rights reserved. that the representative spoke of. complete elimination, you will only get $2 Billion back toward “relief”. “relief” will be diverted to the grow general fund. for a 7.25% sales tax rate. Pretty rotten deal if you ask me. should be OUTRAGED. This is a TAX INCREASE. Where is the Chamber of Commerce now?? Where is Americans for Prosperity?? be crucial to stop this train wreck. GET INVOLVED NOW. Check the link below for a news story from Channel 8. NOT RESULT IN ELIMINATION IS UNACCEPTABLE. AND PLEASE TELL EVERYONE YOU KNOW TO DO THE SAME. We are all aware and dismayed about this issue at both levels . Where does all our money go? As constituents, we DO have the power to direct the purse strings! We will be showing a short DVD that is in line with our topic. Discussion and a plan of action will follow. Learn about the “Shadows of Power”—uncovering the government. The Big Plantation—the United States Is a Corporation (DVD) and Sen. Rand Paul Speaks against the Continuing Resolution (DVD). A discussion will follow. 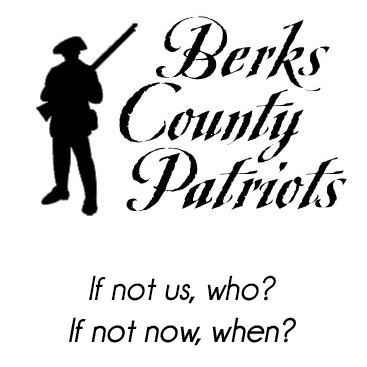 The next meeting is Thursday, October 8, 2015 at 7 pm at the Quakertown Free Library, 401 W. Mill St., Quakertown. inside view of the judicial system. We need people like him in our courts so don’t miss this opportunity! The remaining time will be dedicated to attendee input as to our grassroot efforts and effectiveness. A small donation is always appreciated as the room is NOT free! We look forward to seeing you! why Republicans want voter ID.? for Romney. (A mathematical and statistical impossibility). recorded for Romney. (Another statistical impossibility). Ohio, 106,258 voted in a county with only 98,213 eligible voters. FL, there were 175,574 registered eligible voters but 247,713 votes were cast. a polling location in St. Lucie County, FL had a 158% voter turnout. had a 141% voter turnout. Obama won by 108% of the total number of eligible voters. require a Photo ID in order to vote. Imagine that…..
We hope you are enjoying your summer. This update is to inform you that there will be no August meeting, but we will be having a meeting in September at a new location. We will be meeting at the Quakertown Library again and hope that you will MARK YOUR CALENDARS and join us. We will meet on Thursday, September 10th at 7:00 pm. More information will be upcoming as the date draws near. There is much to do for those that are willing! Please watch your mailbox for our survey. We hope that you will supply us with feedback. Thank you in advance! time will be for open discussion. The topic is Return to Order From a Frenzied America” We hope you will come prepared with constructive thoughts, ideas and opinions for future meetings. Our goal is to be effective as a group and to encourage others to join us in our efforts within the framework of our Mission Statement. (under HOME on the website). Judge Paul Panepinto will stop by toward the close of the meeting. We would like for him to introduce his petitions give a big pep talk and get signatures. We value your input and time and look forward to seeing you. Bring a friend! After Friday’s votes in the House, you’re probably confused about the status of Trade Promotion Authority (TPA). The confusion arises from the fact that a TPA bill was passed by the House on Friday by 219-211. Since the Senate had passed TPA on May 22, this would ordinarily mean that the next stop for TPA would be President Obama’s desk where he would sign it into law. However, when the Senate passed TPA on May 22, it was part of a package that included Trade Adjustment Assistance (TAA) legislation. TAA provides job-training assistance to workers who have lost their jobs due to trade agreements. House leadership decided to separate the TPA and TAA portions of the Senate trade package and have standalone votes on them last Friday. Since the Senate had passed both TPA and TAA as a package, the House would have to pass both TPA and TAA to avoid having to open negotiations with the Senate, coming up with compromise legislation and then voting again in both House and Senate on TPA and TAA legislation. Before the House voted on TAA last Friday, House Democratic leader Nancy Pelosi gave a speech on the House floor in which she asked her fellow Democrats to vote NO on TAA in order “to slow down” the “fast track” TPA legislation and give Democrats the opportunity to amend it. When it came time for the TAA vote, 143 Democrats joined her to defeat the bill overwhelmingly, 126-302. This meant that TPA would be temporarily derailed. Click here to see the details of that vote. How confusing! However, one thing is clear. The House is expected to hold another vote on TAA on Tuesday, June 16, or if not on that day certainly sometime soon. If the House passes TAA, then they will have matched the Senate in passing a TPA/TAA package and that would mean the next stop would be President Obama’s desk where he would readily sign the TPA and TAA legislation into law. Our job is to convince enough of our representatives in the House to vote against TAA this coming week to derail the TPA/TAA package temporarily. If we succeed, then we’ll have some additional time to convince a sufficient number of our fellow Americans to pressure Congress to stop TPA permanantly. Due to last Friday’s vote on TPA in the House where it passed by 219-211, you can click here to see where your representative stood on TPA as of that vote. If you click to see the details of the vote, don’t be confused by the description of it. This was the TPA vote on Friday. This information will help you to understand how your representative might vote on TAA this coming week, knowing that a vote for TAA will be a vote for the TPA/TAA package. Stop the TPA bill by voting NO on the TAA bill. Please email your representative now with the same message. Next, spread the message of this alert to as many others as possible by either posting a link to “Act Now: TPA Can Still Be Stopped!” on social media or by forwarding this email to others. P.S. Click here to view this email as an article at JBS.org. Due to our “double-header” this month with our monthly meeting followed by an all day seminar, we are cancelling our usual June meeting. Learn how to cut through politics and unite your neighbors behind conservative ideals. This is an absolutely must-attend event! We need more people on our side and John shows us proven ways to get them. May 7, 1st Thursday, 7pm CCG monthly meeting: Regional Sustainable Development threatening Private Property rights in YOUR community – what others have done and YOU can do to STOP it! The views expressed herein are not representative of the views of CCG-PA or it's affilates.